From top: Alexander; Castrejon; and Navarro-Mundo were arrested in a 59th-floor apartment after sheriff's deputies performing an eviction found pot, guns, and cash strewn about the residence, police said. 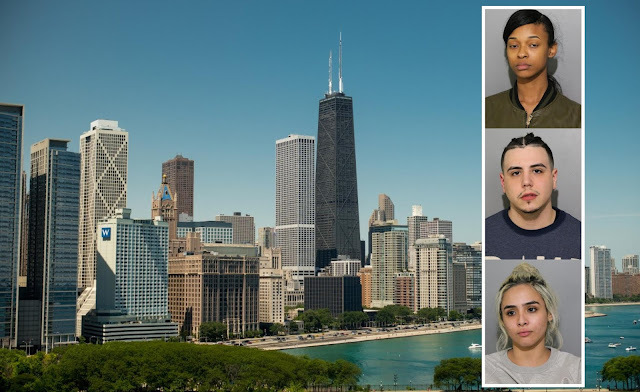 Three people are facing felony charges after sheriff’s deputies performing an eviction found cash, guns, and 30 pounds of pot lying around a Streeterville apartment on Friday morning, prosecutors said. Cook County deputies called Chicago police for back-up after they entered a 59th-floor apartment in the 400 block of East Erie and found what appeared to be a significant drug operation around 11 a.m., according to police reports. Police said they arrived to find “multiple clear plastic bags of a green leafy substance throughout the apartment in plain view.” According to arrest reports, "multiple firearms and large quantities of cash” were strewn throughout the deluxe apartment in the sky. Thirty pounds of suspected cannabis was recovered, according to police inventory records. Giovanni Castrejon, a 25-year-old reputed Latin King gang member of the Garfield Ridge neighborhood, was charged with felony manufacture-delivery of cannabis. Bail was set at $2,000 by Judge Sophia Atcherson. Fabiola Navarro-Mundo, 23, of the New City neighborhood is charged with manufacture-delivery of cannabis and misdemeanor possession of a handgun without a valid Firearm Owner ID card. Deputies said they saw a pistol in her purse when they arrived. She was released on a recognizance bond by Judge Atcherson. Michelle Alexander, 24, of the West Pullman neighborhood is charged with felony manufacture-delivery of cannabis. She was also released on a recognizance bond. Castrejon’s criminal history includes a two-year prison sentence for manufacture-delivery of cannabis in 2017; four years for domestic battery-strangulation in 2014; and four years for aggravated possession of a firearm by a gang member in 2010, according to court records. The trio is due back in court on June 5th.